These teams will be playing for $200,000 tomorrow. Today was a big day for the Overwatch League. The second season semifinals for stage one debuted on ABC, marking the first time the league has been shown on network television. Beyond that, fans were glued to the games to find out which teams will be in tomorrow’s stage grand finals. Unfortunately for fans of two of those teams, both games were sweeps. The Vancouver Titans and the San Francisco Shock will be competing in tomorrow’s stage one grand finals. Semifinal matches were a first-to-four series, upgraded from the Overwatch League’s usual best-of-three method. The Vancouver Titans demolished the Seoul Dynasty with a 4-0 score—and the San Francisco Shock did the same to the Philadelphia Fusion with another commanding sweep. Vancouver have been dominant throughout the entire first stage, coming into the playoffs undefeated. The semifinals were no different for the Titans. On first stage Busan, they quickly took their first map point thanks to main tank Park “Bumper” Sang-beom’s aggressive playstyle. The Seoul Dynasty got to choose the next map, Hollywood, and put up a good fight against the Titans. Seoul’s expert Sombra Choi “Michelle” Min-hyuk shined when given the chance, throwing down full-team EMPs and nearly backcapping Point B. Many analysts predicted this match to be a back-and-forth power play between two relatively-similar teams. Both the Shock and Fusion are playing with mixed-language rosters and routinely manage to pull out wins where they statistically shouldn’t. Unfortunately for the Fusion, their luck had run out. Ilios was the first map played in this series—the map went so quickly in the Shock’s favor that production barely had time to get highlights. On Hollywood, the San Francisco Shock gave a dominant showing as they completed the entire map. Shock’s support duo, Grant “Moth” Espe and Park “Viol2t” Min-ki, managed to keep their team healed throughout Fusion’s aggressive attacks. The Shock managed to full hold Philadelphia’s attack and went up 2-0 at halftime. Even after that level of demolition, the Fusion managed to rally and looked to reverse sweep on Horizon Lunar Colony. Fusion off-tank Gael “Poko” Gouzerch threw a massive D.Va Self-Destruct—one of his trademark “Poko bombs”—that allowed the Fusion to take both points. But even the biggest of bombs is no match for Jay “Sinatraa” Won on Zarya, leading the San Francisco Shock to victory on Horizon. 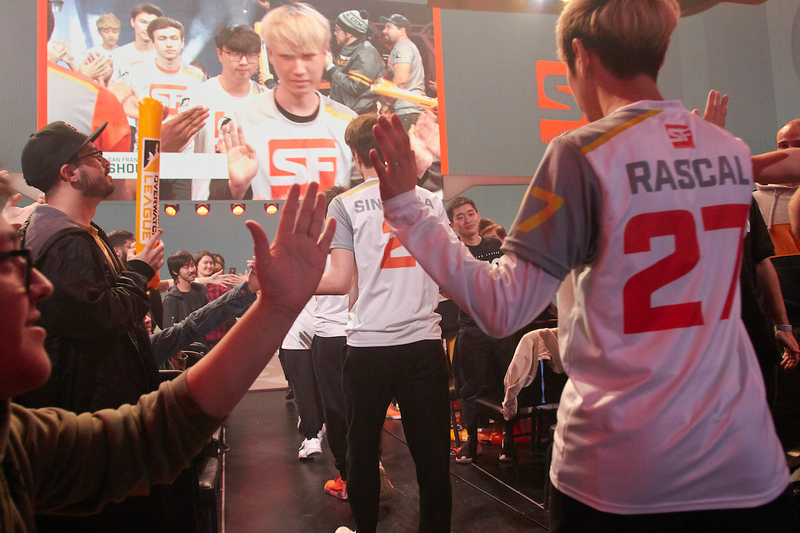 The final map, Rialto, was a repeat of Hollywood, in which Sinatraa and main tank Matthew “super” DeLisi led their team to full hold Fusion’s attack. The stage one grand finals take place tomorrow, March 24, at 2pm CT. The Vancouver Titans and San Francisco Shock will play in a first-to-four matchup to see who wins the stage championship. It’s also a special event for both teams. This is the first playoff appearance for both the San Francisco Shock and the Vancouver Titans, who are an expansion team added to the league this year. The match comes with a hefty prize—$200,000 to the winning team—and the bragging rights of being the season’s first stage champions.